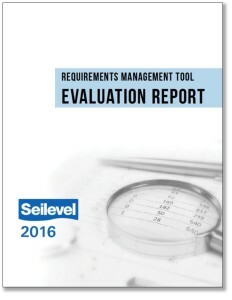 An updated version of Seilevel’s Requirements Management Tool Evaluation Report! New tools, new features, new reviews notes, and new rankings! It has been a short five years since the last time Seilevel underwent the process of evaluating a large group of requirements management tools available in the market. We have recently completed a similar round of evaluation with updated results and scoring for the latest tools on the market today, and are very pleased to finally share this report with the general public. In the 2016 Requirements Management Tool Evaluation report, we provide an overview of our evaluation process, and detailed reviews of 21 different tools that made it to Phase 2 of the evaluation (our final phase). There is also an appendix at the end of the report which lists all of the 180+ tools identified for this assessment. Click below to prompt a download of your copy. Before any conclusions are drawn from the overall ranking, remember that the weighted scores are based on Seilevel’s prioritization of the criteria. You can -and should- change the criteria to meet your organization’s needs. We recommend you skim the comments for the criteria you care about most, then modify the level of prioritization as necessary. Have questions about the scorecard? Email us at info@seilevel.com. Late 2011, Seilevel researched a wide range of requirements management software and tools to evaluate which might be best suited to implement internally. Since we knew several of our clients were curious about the results, we decided to document and publish our findings of the evaluation. We then chose to share our research methods and results with the larger business analysis community. You will find this information useful whether you are currently using a requirements tool or are considering implementing a new tool. There are more than 100 requirements management software vendors in this market; finding the best tool for your needs requires a comprehensive evaluation of the options available. At Seilevel, we are particularly interested in advanced modeling functionality within these tools to support Requirements Modeling Language (RML®), the visual modeling language our business analysts use for developing requirements. Compared to previous requirements tools research we did in 2007, a number of tools now support RML, and there is also better support in general for working offline (both key features for our consultants). Here are some resources that may help you evaluate which requirements management software might be best suited for your organization. This white paper describes the approach and criteria used in Seilevel’s most recent research study to evaluate requirements management software, including improvements to allow the results to be used by anyone looking to evaluate and implement an RM tool. This white paper presents the results of Seilevel’s full evaluation of the top 17 tools selected from the initial evaluation, including each tool’s strengths and limitations. The research approach and results are structured in a way to help make other organizations’ tool evaluations easier. Note: All 17 of the tools evaluated are worthy solutions depending on your organization’s needs, and we strongly encourage you to evaluate all of them using your own priorities. Seilevel’s ranking is not meant to be an endorsement of any tool in preference to another, but rather reflects Seilevel’s proposed priorities for tool criteria. Fill in the information below to download a copy of Seilevel's editable comparison of Requirements Management software tools.